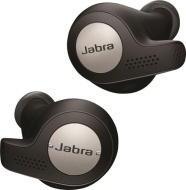 alaTest has collected and analyzed 103 reviews of Jabra Elite Active 65t. The average rating for this product is 4.3/5, compared to an average rating of 4.2/5 for other Headphones for all reviews. Reviews about the durability and comfort are on the whole positive. The size and usability are also mentioned favorably, but opinions are divided on the bass quality. We analyzed user and expert ratings, product age and more factors. Compared to other Headphones the Jabra Elite Active 65t is awarded an overall alaScore™ of 98/100 = Excellent quality. The Jabra Elite Active 65t earbuds are tough enough for the usual splashing of sweat during a workout or when you are caught in the rain. It uses the latest Bluetooth 5.0 technology with a range of 10 meter, and you can pair it with 2 devices at a time. For voice commands and digital assistants, the Jabra Elite 65t is compatible with Alexa***, Siri® or Google Assistant™.